Moving and packing services are our most frequently selected option for customers moving locally and across the country. When it comes time to plan your move, our experts will walk you through all of the available plans to ensure we have a great fit for your unique moving timeline and budget. Full service moving services typically includes packing, loading, driving, unloading our moving truck(s), unpacking, and with the option to include cleaning services, storage, junk removal and more. Our award winning full service moving and packing experts are held to high training and safety standards. Among the best ratings in the industry, our care and consideration is evident in every moving and packing assignment we complete. Our team will arrive to organize, pack and label all of the contents of your home or office, safely and efficiently. With moving and packing services combined, we provide adequate support to ensure we stay within your timeline, without sacrificing the quality of our service. The supplies used are the best in the industry, ensuring your possessions are protected every step of the way. There are no hidden fees, and no surprises. Our experts are also available for full-service moving, without packing included. Since packing services take time and additional cost, it is common for our customers to select full-service help without packing. This means you would pack, organize and label your own belongings for us to load. For office moves, we can provide detailed organization plans, and for home moves, this can be a great way to save costs on your move. On the day of the big move, we will load the items properly, transport and then unload using the box labels and your direction. We offer packing supplies with free delivery, and encourage customers to use the appropriate materials. Keep in mind, your move is only as successful as your packing! Be sure to label properly, avoid putting heavy items with fragile ones and follow all packing best practices. Learn more about our labor only moving services today. Call today to talk with one our moving and packing service coordinators, or get started with our easy online quote! 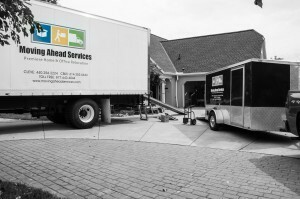 Plan your move with the trusted, experienced full service movers at Moving Ahead Services today. Experienced, insured full service movers. Specializing in local and long distance relocations for your home or office.